BASINS ARE LARGE-SCALE depressions in the land surface or seafloor. Their sides may dip gently or steeply, but their bottoms are always wider than they are deep. Streams flowing into basins often fill their floors with sediments. Lakes typically occupy lower parts of the basins on land, thus they may fully emerge as lakes dry up. The largest water-filled basins are ocean basins—the PACIFIC, ATLANTIC, and INDIAN ocean basins. Basins exist because of land erosion or structural geology. Three agents of erosion are prolific creators of basins on land—rivers, glaciers, and groundwater. Rivers form large drainage basins by eroding mountainous areas through tentacle-like systems of incising tributaries. The MISSISSIPPI-Missouri River and the Ohio River basins are examples of this basin type. Glaciers create basins by plucking (quarrying) huge chunks of rock as they move over underlying bedrock. They reveal the basins after they melt back during warm periods. The size of glacier basins varies considerably. The now extinct Laurentide ice sheet created the Hudson Bay Basin in northern CANADA. In the continent’s midsection, the same glacier quarried the Great Lakes basins and the smaller but impressive Finger Lakes basins in upstate NEW YORK. Former alpine glaciers scoured even smaller basins—cirque and rock basins that are scattered throughout the ROCKY MOUNTAINS, HIMALAYAS, ALPS, and other high Alpine regions. Groundwater (or water underground) also creates basins. The cool water is acidic and dissolves limestone to create a Swiss-cheese network of underground solution channels and subsurface caves. Over time, a cave roof collapse creates increasingly larger basins, which geomorphologists call dolines and uvalas. These solution basins are typical of KARST regions (areas whose landforms develop by solution in limestone). Oceanic, intermontane, fault block and synclinal basins are results of rocks that subside, warp, fold, or break. The shape, size, and topography of oceanic basins are results of all these movements. Ocean basins have many structural sub-basins that collect thick, undisturbed layers of fine-grained deposits. 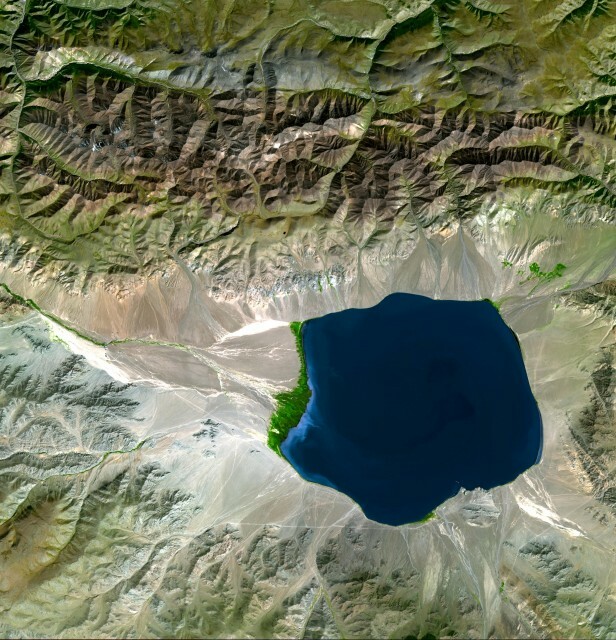 On land, the largest basin is the intermontane basin, a broad area enclosed by higher landforms. The Great Basin region, which sits between the Pacific Mountain System and the Rockies in the western UNITED STATES, is a good example. A third basin type—the synclinal basin—is composed of downfolded layers of sedimentary rocks. The LONDON or PARIS basins are examples. Synclinal basins can be important, as they fill with sediment and thereby help preserve any layers of coal beneath, such as in the Saar Basin in FRANCE, the Donets Basin in UKRAINE, or the Wyoming Valley in PENNSYLVANIA. The smallest basin is the fault block basin (graben), which is typical of basin-and-range terrain. Vertical displacement along the faults (normal faulting) creates the basin. The Great Basin region has numerous fault block basins and intervening ranges.